What do you do on a Saturday afternoon? How do you spend your Saturday afternoon? Shopping, spending time with the family or at the footy…. Well, I spent the afternoon playing for Oxfordshire in the Chiltern League Division One. I have been involved in for the U150’s for the last couple of years and having some decent results I got the call from Simon King and was asked to play for the Oxfordshire A team. In reality I think he was a few players down which was why I was asked! I managed to get a draw in the end after nearly 4 hours of play. Simon’s view of the match is below. “This was narrowly lost by us 9-11, and could easily have gone the other way. 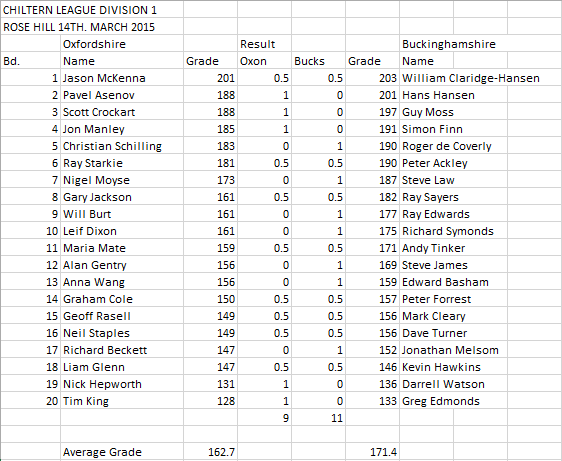 outgraded on every board, by an average of 9.2 points.